bat printed in black with Spode's pattern 557 with gold rim and line added. The pattern was derived from Buffon's Natural History published in English by J.S. Barr, Bridges Street, Covent Garden, 1792. In Buffon's English version the two animals appear as separate engravings. In Spode's version of the copper engraving for the bat print, the two animals are placed together. Print number P406 from the Animals series, reference is Drakard, David and Holdway, Paul. Spode Transfer Printed Ware, 1784-1833. Woodbridge, Suffolk, Antique Collector's Club, Inc., 2002, page 147. Shown here is a side view of the handled bute shaped cup. 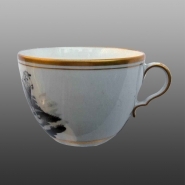 A bone china bute shaped teacup, bat printed in black with Spode's pattern 557 with gold rim and line added. The pattern was derived from Buffon's Natural History published in English by J.S. Barr, Bridges Street, Covent Garden, 1792. In Buffon's English version the two animals appear as separate engravings. In Spode's version of the copper engraving for the bat print, the two animals are placed together. Print number P406 from the Animals series, reference is Drakard, David and Holdway, Paul. Spode Transfer Printed Ware, 1784-1833. Woodbridge, Suffolk, Antique Collector's Club, Inc., 2002, page 147.